Just q quick email to let you know I have just added a brand new bag pattern to the Stitching Cow website. This is one of my favourite designs. It includes hand applique and a touch of embroidery, it was so much fun to make. 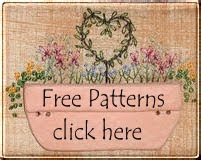 The pattern is available as a paper pattern which can be posted to you, or as an e-pattern which can be downloaded immediately to your computer. In fact you could be starting to sew this pattern within an hour, the longest part will be trying to decide on the perfect fabric for the background. I chose a heavier fabric that already had a random floral design on it. I was very pleased with the overall effect, it gave the design much more depth. If you would like to try your hand at this pattern, head on over to the Stitching Cow website for all the details, including some more closeups of the details on this bag.